August 2007 – Route 79 Journal . Exploring the outskirts of London. Yesterday I used my Oystercard to get to Heathrow. The Western-most end of the Piccadilly Line. Only a few more public transport hops away is a wonderful suburb of London where you can just imagine being on the set of the Blues Brothers. A suburb of London called Chicago. I’ve often said that the best views of London are to be had from the top deck of a London bus. When it’s not raining, ordinary life can be seen scrolling by. But when the heavens open, the focus shifts to the rain water scrolling down. 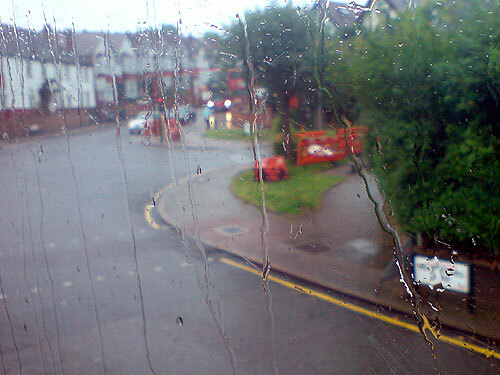 Rain has been the main climatic feature of this summer in London. I guess I should be thankful for small mercies. Like being warm and dry and having a home to go back to at the end of the day. Hopped over to Belgium for short break in Brugge (Bruges) earlier this week. The Eurostar service from Waterloo to Brussels is excellent: only two-and-a-half hours and very cheap tickets if you book in advance and go off-peak. It’s just sad to be back so soon. Click on the green button below the picture and turn up the volume. When the song loads, press play and stare at the picture in a dreamy fashion and imagine something really sad happening there. It’s a really nice but also really sad song called Tujhe Yaad Na Meri Aayi sung by Alka Yagnik and Udit Narayan from the film Kuch Kuch Hota Hai released in 1998. Manpreet Akhtar opens the vocals to this song, but Alka dominates in a song which I think is one of her best performances. Music by Jatin-Lalit and lyrics by Sameer.